By lowering the expression of a single gene, researchers at the National Institutes of Health have extended the average lifespan of a group of mice by about 20 percent — the equivalent of raising the average human lifespan by 16 years, from 79 to 95. The research team targeted a gene called mTOR, which is involved in metabolism and energy balance, and may be connected with the increased lifespan associated with caloric restriction. We analyzed aging parameters using a mechanistic target of rapamycin (mTOR) hypomorphic mouse model. Mice with two hypomorphic (mTORΔ/Δ) alleles are viable but express mTOR at approximately 25% of wild-type levels. These animals demonstrate reduced mTORC1 and mTORC2 activity and exhibit an approximately 20% increase in median survival. While mTORΔ/Δ mice are smaller than wild-type mice, these animals do not demonstrate any alterations in normalized food intake, glucose homeostasis, or metabolic rate. 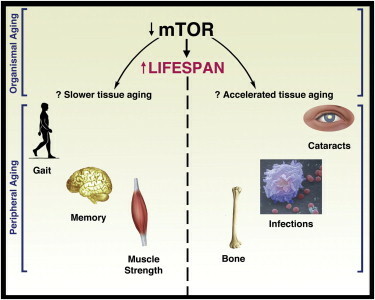 Consistent with their increased lifespan, mTORΔ/Δ mice exhibited a reduction in a number of aging tissue biomarkers. Functional assessment suggested that, as mTORΔ/Δ mice age, they exhibit a marked functional preservation in many, but not all, organ systems. Thus, in a mammalian model, while reducing mTOR expression markedly increases overall lifespan, it affects the age-dependent decline in tissue and organ function in a segmental fashion.